business opportunities contacts within seconds. Reach out to potential business partners in a scalable way. Find the right candidates email addresses and save them into organized lists. Email is the universal communication channel of today’s digital world. The email finder is built to help companies reach out to their potential prospects in an actionable, accurate way while saving time and money on sisyphean tasks and wasted opportunities. Upload CSV contact lists from any source or platform to enrich it with valid email addresses, the email finder will notify you by mail when the list is ready, download sample file. Supercharge your solutions with our REST API and find email addresses with a single HTTP request, read more. 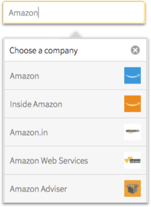 Export or send your prospects lists to more than 500+ apps using Zapier, see full list. Start typing a company name and we will automatically suggest it domain name. Each result is returned with a confidence score that reflects the deliverability of each email.